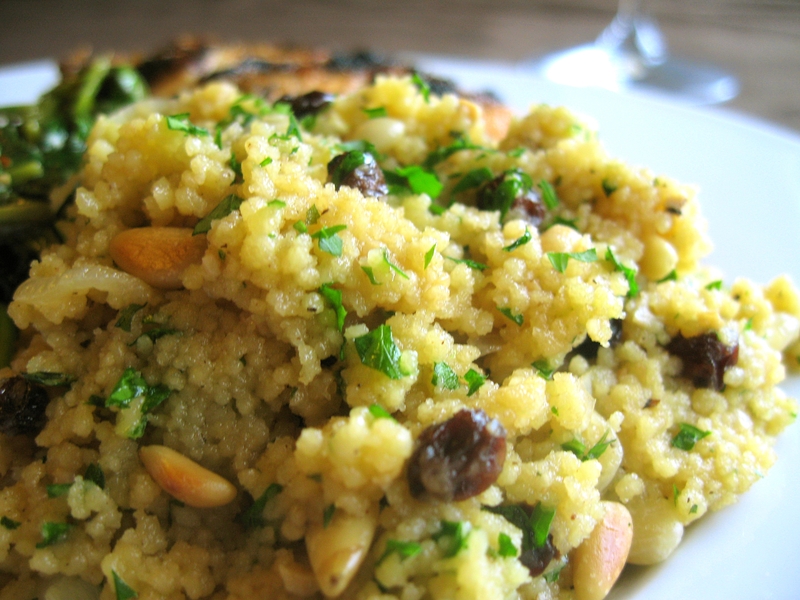 Couscous is one of my favorite side dishes. It takes no time at all to prepare, it barely requires cooking, and it is easy to make really flavorful. Here I sautéed two large shallots and several cloves of minced garlic in some extra virgin olive oil. I added homemade chicken stock, salt, and freshly ground black pepper. Once the mixture came to a boil, I removed it from the heat, added the couscous, and covered it with a lid. After five minutes, the couscous was cooked. I fluffed it with a fork, added a handful of chopped fresh Italian flat leaf parsley, a couple of tablespoons of Parmigiano Reggiano cheese, toasted pine nuts, and some dried currants. This is easy enough for any weeknight meal, but special enough for company. 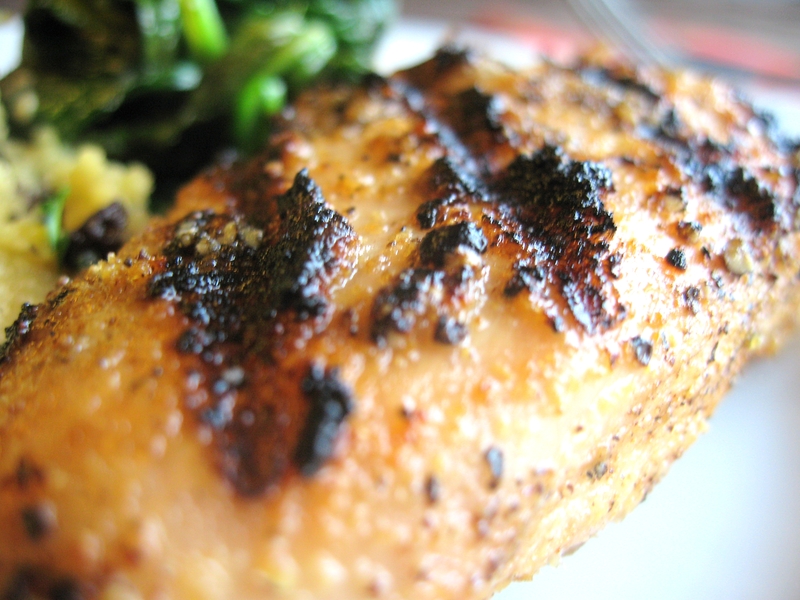 Here it dresses up a simple, grilled boneless, skinless chicken breast (seasoned with extra virgin olive oil, salt, freshly ground black pepper, and garlic), and sautéed spinach (sautéed with extra virgin olive oil, garlic, red pepper flakes, salt, freshly ground black pepper, and finished with a squeeze of fresh lemon juice). This is the perfect no fuss lunch or dinner. Ready in minutes, delicious, and sure to satisfy. Enjoy! 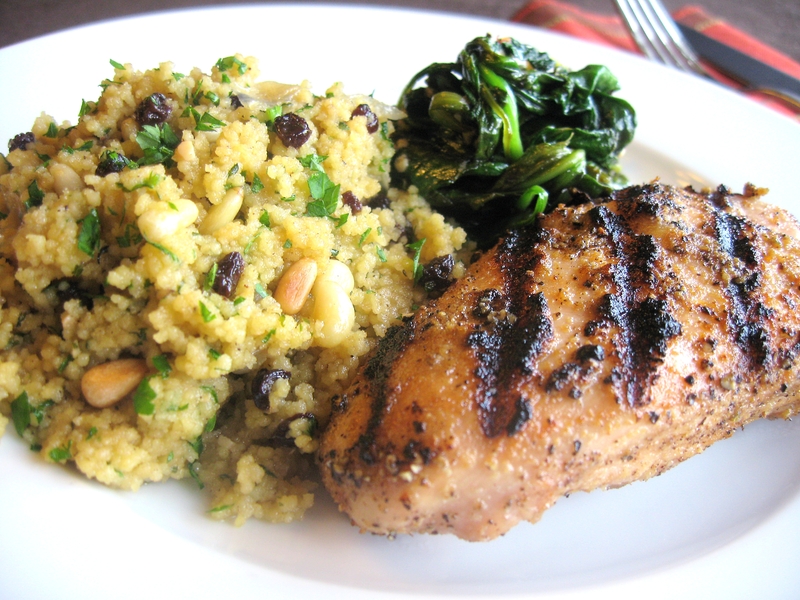 Wonderful recipe – couscous is one of the foods that is hearty yet light. Great traditional flavor profiles with the currants and pine nuts – perfect. damn fancy looking! did obama come to dinner? Will definently try your techniques next time I make couscous. 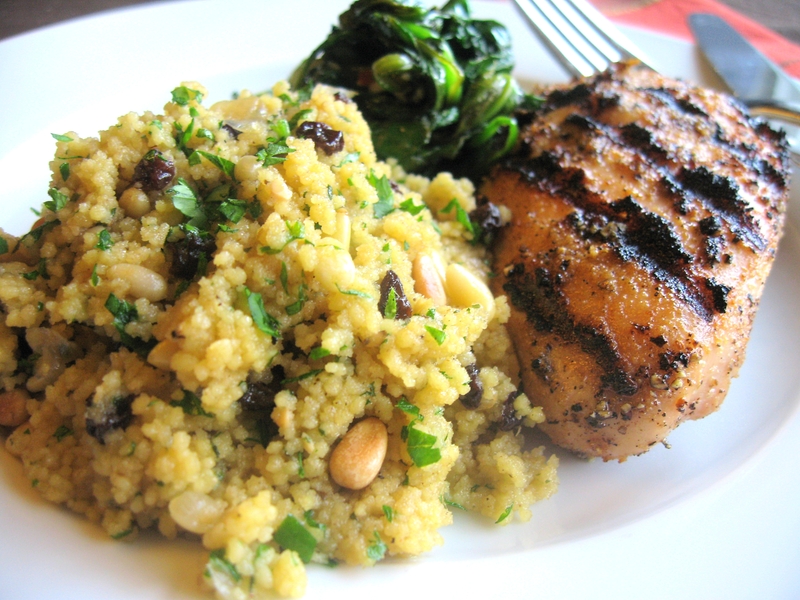 I love couscous because it’s so easy and fast – adding pine nuts and currants certainly dresses it up!